The World's First and Only Smart Fender! Seahorse Fenders comes in two sizes to meet your individual needs, 26″ X 9″ and 22″ X 7.5″. Both sizes stand upright and hold their own line for easy storage. Fenders come in White or Blue. Our straps are made from 1 1/2″ heavy weight woven polypropylene, made for industrial and outdoor use! Repels water, is mildew resistant and low stretch. The webbing has a tensile strength of 800 pounds per inch! Unstrap your Fender and take it with you for your next stop, or leave it on for the season! Not only do they work as a regular fender, they also take up no more room! No more hassle storing fender boards anymore with a Seahorse Fender! Even on a floating dock, Seahorse Fenders will give you that added protection against a choppy day or boat traffic. 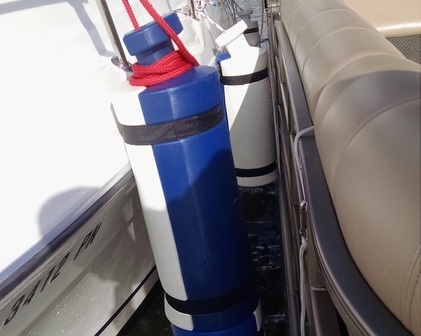 Simply lock two Seahorse Fenders together and you are covered from your cleat to the water line! 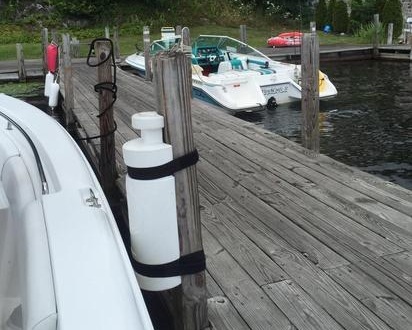 No more fender on the dock or in you boat. Seahorse Fenders will match up to your tender like no other. Rafting up with friends has never been safer or easier. Your Seahorse Fender can go from the water line to your cleat. Works great with all boats, even Pontoons. Seahorse Fenders are the ultimate lake fender. Leave them on for the season or take them for the ride. Seahorse Fenders are there for the big tides too. Lock them together for the coverage you need. We have all come back to something like this. Never again with the one and only smart fender!